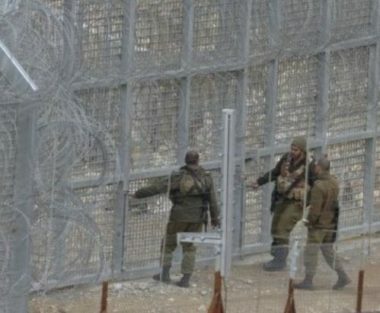 According to the Israeli News Agency (News 0404), Israeli soldiers shot and killed, Wednesday, one Palestinian, injured and detained another, and arrested a third who was unharmed, after they reportedly crossed the perimeter fence in Gaza. The Israeli report claimed that the Palestinians, who reportedly carried knives, crossed the perimeter fence and “did not heed the soldiers’ command to stop,” before the army opened fire at them, killing one, and wounding another in addition to arresting a third Palestinian, who was apparently unharmed. It added that the soldiers moved the two injured Palestinians to Soroka Medical center after shooting them, but one of them was declared dead upon arrival, while the second Palestinian suffered mild wounds. So far, no further information was provided about the identities of the three Palestinians. The incident apparently took place in southern Gaza, and was not confirmed by Palestinian sources. The explosive was described as a “powerful bomb with a round structure and a dome,” that could cause damage to armored military vehicles.